The Redskins took the training wheels off Keenan Robinson in 2014 when he replaced longtime starting linebacker London Fletcher. Keenan had 71 tackles (33 assists), 1.5 sacks, 6 TFL, 3 passes defensed, and a fumble recovery in 13 games this last season. In back to back seasons, Robinson had season ending injuries before the season began, but he took the best from it and decided to play relentlessly- because any day it could all be over. With an increased fire for the game, Robinson had assumed duties as the defensive play caller in the huddle in 2015. 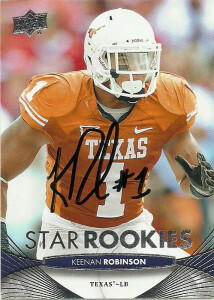 In 2016 Keenan was surprisingly allowed to sign with the division rival New York Giants. He dressed for all 16 games and started 6 at middle linebacker putting up 79 total tackles and 7 pass deflections. An athletic and speedy defender, Keenan has the speed to keep up with runningbacks and tight ends in pass coverage. He also has the odd honor of picking off Tom Brady twice in his short career. Robinson was being interviewed off to the side at the Lone Star Showcase. He was very happy to sign anything that anybody had at the event and patiently talked to every fan if they had something to say. The Showcase was fun, but listening to kids participating in the Showcase chide and heckle fans and adults who wanted autographs was a disappointing sight. It’s easy to bite the hand that feeds you if you do not understand that: Simply put, fans dollars are what keep the sport going and fan patronage is what pays for camps for kids. 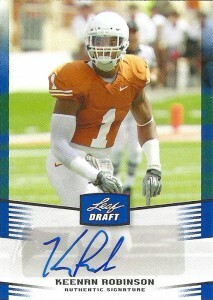 Keenan Robinson was a solid outside linebacker for the Texas Longhorns as a 3 year starter. In the 2011 campaign he notched 106 tackles, 10 TFL, 1 sack, and 2 FF. Keenan also earned Holiday Bowl MVP Honors after the season. Keenan in college wore (from what I can tell) undersized pads. Either that or the technology has come so far that they look small. Initially the name did not click when I got the Leaf Draft box breaker and I thought he was a wide receiver. His combine numbers were purely average, but this was good enough to rank him 4th among inside linebacker talent. 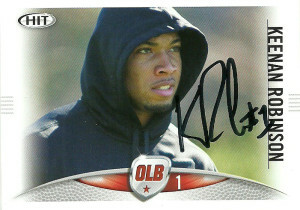 A solid athlete, with a nose for the ball and decent pass coverage skills, Keenan was drafted in the 4th round of the 2012 draft by the Washington Redskins. Jim Haslett and his defensive staff immediately shifted him to inside linebacker in the hope that he can become one of the heirs to aging superstar London Fletcher, but in the meantime expected Robinson to get a lot of repetition on special teams and sparse time full-time in the lineup. He was able to scoop up 12 tackles, but blew out his pectoral muscle in Week 12 and missed the remainder of the season. I got into the Longhorn Bowling event sheerly through my connections, and while I was there I happened to bump into James Kirkendoll who had shaved his dreds off. Along with him were Aaron Williams and Keenan Robinson. – I embarrassingly did not recognize them. They sat down and had lunch with me and were talking a whole gambit of topics from football to the women of Montreal. Later once the bowling teams were announced I finally attached the names to the faces that were sitting in front of me a short time earlier. 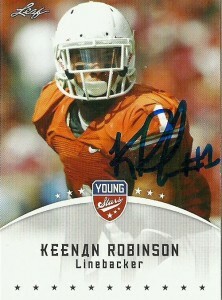 Keenan took it all in stride and signed the Leaf Young Stars 2012 card for me. It turned out to be a great event and I hope that they consider expanding it in the future on a limited basis to the general public.